He had another solid work, breezing 5 furlongs in a bullet 1:01. Can you say a horse is boring and mean it as a compliment? Yes, if you’re referring to Mohaymen, who runs perfect, acts perfect, and trains perfect. So, yes, he is boring in that he does everything perfect and presents few if any challenges. He’s not a Mickey Mantle type who will strike out three times and then hit a 500-foot home run. He’s the quiet, rock-solid type who you want up with the bases loaded and two out. He’s not going to dazzle you with his speed or his power. He’s just going to beat you, and do it methodically and with great efficiency. His biggest battle is approaching, as he prepares to defend his home turf against the undefeated champion Nyquist, who is coming a long way to invade his territory and walk off with a million-dollar bonus. You can bet McLaughlin does not want him to do it at Mohaymen’s expense and his unbeaten record. No matter who wins, it would be ideal to see both horses put on a show without beating each other silly. Welcome to the Kentucky Derby five weeks early. You’re always taking a chance when you get high on a horse whose two best races have come at Tampa Bay, due to the quirkiness of the surface, but we have had two Kentucky Derby winners come out of the Tampa Bay Derby since 2007, including Pletcher’s only Derby winner. This colt has always possessed the physical tools to be a top-class horse. He just needed his mind to catch up. Ever since he was a baby, he’s been quick, strong, and athletic. But when those attributes are combined with a stubborn streak, it often results in exercise riders being tossed on their fanny, as was the case with this colt. But now that he apparently has matured mentally and become a professional racehorse, who knows how high he can ascend. Another aspect of his Tampa Derby score that I liked is he was some 5 lengths clear of Outwork immediately after the wire. His owner, Twin Creeks Racing, has had success with grays, most notably Mission Impazible and Graydar, so they didn’t mind going up to $400,000 to purchase him at the Keeneland September yearling sale. And being a full brother to the classy Creative Cause didn’t hurt. He worked 5 furlongs in 1:01 2/5 in preparation for his Gulfstream Park invasion. O’Neill, as he did with I’ll Have Another, likes to have his horses put in a strong gallop before breaking off in their works. Because of his stiff training methods, he feels Nyquist does not need much racing. And he’s certainly not going to get much, with only the single two-turn race before the Kentucky Derby. If O’Neill can pull it off and get Nyquist to win at Churchill with only a total of 16 furlongs under him, then he will have written a new chapter on Derby training. He did get I’ll Have Another to win the Derby from post 19 with a limited racing foundation and repeat in the Preakness, so if he believes this is the best way to get the horse in winning form for the Kentucky Derby and make it through the entire Triple Crown successfully then more power to him. I just hope it doesn’t set a precedent, otherwise Derby starters in the future will be pretty much strangers to racing fans, who will know little about them and see little of them. Nyquist’s connections obviously would like the attempted Florida Derby heist to be a fairly easy caper and not take too much out him. But he’d probably be better off getting into a bit of a brawl with Mohaymen in order to toughen him up for the grueling mile and a quarter that lies ahead. He certainly is solid and dependable. The question is, can he grind it out for most of the race and expect to pick up all the pieces with a late burst in the final sixteenth? In the San Felipe, it’s uncertain whether he accelerated late or the others were beginning to slow down a little. He seemed to be one-paced for most of the stretch run before moving off the inside and appearing to kick it into another gear in the final sixteenth. We just don’t know if he actually did, as horses don’t normally accelerate like that after running one-paced without a little help from the horses in front. But who knows, maybe that’s his style and he somehow saves that extra burst for the end. They key is getting him to relax early and then start closing in on the leaders a little sooner. These are better horses than the ones he had been beating. We know he has tactical speed if you want to use it, as he demonstrated in the Kentucky Jockey Club Stakes, in which he pressed the pace and then hung in there gamely down the stretch. Even though he has plenty of stakes experience, we’ll have a better idea what to expect on the first Saturday in May by the way he runs in the Santa Anita Derby when Baffert will have the screws tightened more. He has made a career of utilizing the final Derby prep to its fullest and then having his horse peaking at Churchill Downs. There is no doubt this horse has the tools, being remarkably consistent and possessing a long, easy-going stride that makes it look as if he’s just going along at a leisurely pace. We just have to wait and see if he can deliver his closing punch a little earlier and with a bit more authority. I have to admit, with at least four or five pace horses in the Rebel, I didn’t expect to see him on the lead. But by doing so, he showed his versatility. He had to go his opening quarter in a swift :22 4/5 to outrun the others, and despite racing greenly turning for home, he did re-break when challenged. What was most impressive is that he just didn’t dig in and turn back Whitmore’s challenge, he actually found another gear and was drawing away again at the end, and was four or five lengths clear several strides past the wire. He did show his greenness by ducking to the rail after turning for home, but quickly straightened himself out. You have to remember he is a May 19 foal, so he will not turn 3 until two days before the Preakness. Also, for him to come off a maiden race, travel cross-country, break slowly, rush to the lead in :22 4/5, and still turn back the challenge of a very good horse and draw clear again with final sixteenth in a hair under :06 1/5 was very impressive. I still believe his best races will be from off the pace. His final time of 1:43 4/5 was faster than the Razorback Handicap and Azeri Stakes for older horses run earlier on the card, and the horses chasing him, within 3 lengths of him early, finished in order, 14th, 12th, 9th, and 13th. From a color scheme, he is one of the most pleasing horses to look at, with his light gray coat, blue silks and shadow roll, and black blinkers, not to mention his $900,000 price tag, for whatever that’s worth. To repeat, however, he is a half-brother to four pure sprinters and a full-brother to a horse who broke his maiden at a mile for Baffert and then was retired after two poor efforts. In the plus column, he does trace to the great mare Gallorette and is inbred to Victoria Regina (Rasmussen Factor) through her sons, Canadian 2-year-old champion Viceregal and 13-time leading sire in Canada Vice Regent, both sons of Northern Dancer. After three straight front-running victories, it is natural to question whether he can be as effective sitting off the pace. Front-running victories in the Kentucky Derby are pretty rare, although several horses have run big seconds on the lead. It is possible he simply is the speed of the speed, and there is no one who can, or is willing, to outrun him. When you run your opening quarters in your races in :22 3/5, :22 4/5, and :23 and your halfs in :45 3/5, :46, and :46 3/5 (on a dead track), there are not going to many willing to take you on early. Therefore, it will be interesting to see if anyone does in the Santa Anita Derby and risk jeopardizing their chances of getting in the Kentucky Derby. His sire and broodmare sire both had extraordinary speed and could carry it two turns, so you can’t count on him coming back to you without someone putting pressure on him early. But at what cost? It will be up to Sise and Mike Smith to decide whether they want to continue doing what they’ve been doing and try to take them all the way in the Santa Anita Derby or look ahead to Louisville and try to get him to take back off the pace, as American Pharoah did last year in his final prep. The bottom line is that this colt, like American Pharoah, has the ability to run fast and appear as if he’s doing it will little effort, and those kinds of horses are awfully dangerous. It’s finally time to find out where we really stand with this horse. I’ve spent too many weeks writing about slow breezes and trying to justify why he’s still ranked this high. Let’s not forget, he did run second to Mohaymen when taken out of his comfort zone. I’m sure Schettino has an agenda, and we might as well just wait until he walks into the starting gate Saturday instead of trying to figure it out. Here are his works since the Holy Bull – 1:02 1/5, :49 3/5, 1:02 4/5, 1:02 2/5, :49 1/5, and :50 4/5. Schettino obviously would like to see him drop back off the pace as he did in the Champagne instead of being on the pace as he was in the Holy Bull, and apparently feels all these slow works will accomplish that. Will he return to his old running style or will he be fresh again, as he was in the Holy Bull? He did draw post 2 in the Louisiana Derby, in which there is only one true speed horse, so it will be interesting to see where John Velazquez has him early on. Hopefully, he won’t be too fresh. Perhaps he can be effective as a stalker, as he did show good early speed in his maiden victory at Saratoga. But thinking ahead to the Kentucky Derby, mid-pack would be an ideal spot for him. Also, will he be able to get enough out of the Louisiana Derby, style-wise and fitness-wise, to then wait another six weeks to the Kentucky Derby? I do believe he is a very talented horse. While I’m surprised by the road he is taking, timing-wise, I am counting on that talent to at least get him to the Derby with a fighting chance. If he wins in the Kentucky Derby off this schedule, Schettino will be applauded for his unique handling and extreme patience and re-writing the history books. If he runs poorly, or doesn’t even make it, that’s another story. Trying to separate the closers in the Rebel is extremely difficult. You can make a case for all of them or you can dismiss them all. I can’t give up on this colt until he gets a decent post and a decent trip. You cannot check at the back of a 14-horse field at the five-sixteenths pole, swing 8-wide, and expect to pass 12 horses in a little over a quarter of a mile. I thought he was going to take back immediately from the 14-post and work his way to the inside, but he was actually ridden out of the gate and wound up 5 to 6-wide heading into the first turn before finding a path about four-wide. I’ve been saying all along this colt has more speed than people think, but breaking from post 14 I’m not sure this was the time and place to use it. So for a horse who broke his maiden battling head and head on the lead and who was four lengths off a :44 2/5 half in a seven-furlong stakes, here he was again far back in a 14-horse field, more than a dozen lengths off the lead. Before he could begin his run, Creator passed him on the outside and then Cherry Wine went by him. When he was finally able to move out, he had to check fairly hard with Luis Quinonez grabbing a hold of him. He then had to quickly shift gears again and was taken 7 to 8-wide to make his run, with more than 10 lengths still to make up. He turned it on in the stretch and was flying by horses, but had three strong closers in front of him who had gotten the jump on him. With all the horses in front of him coming home the final sixteenth in fast time he still was beaten only 4 3/4 lengths, just missing fourth by a head, and it is important to note he was conceding five to seven pounds to the four horses who finished in front of him (seven pounds to the winner). With his natural speed, that he hasn’t been able to use in his two races at Oaklawn, and his pedigree, I believe you will see a much better horse with longer distances and a decent post. I put him in the Top 12 last week in anticipation of a big effort in the Rebel, and it’s difficult to drop him after his excellent second-place finish. Although twice now he has appeared to make a big winning move, only to fail to sustain it, there is no doubting his powerful turn of foot. After getting blown by in the closing stages by Suddenbreakingnews in the Southwest, and being unable to get by Cupid in the Rebel, some feel he may be distance limited, but it is important to note that he did have to break from the 12-hole and got caught very wide (wider than Suddenbreakingnews) going into the first turn, and then rallied four-wide on the far turn, which should give him a Thoro-Graph number comparable or even better than the winner. For the second straight race he demonstrated his quick-fire acceleration at the five-sixteenths pole, pouncing on Cupid in a flash. Unfortunately, just as Cupid was ducking to the inside, making him vulnerable, Whitmore was failing to negotiate the turn into the stretch, winding up about seven paths off the rail. By the time he managed to straighten himself out and launch another bid, Cupid was back in stride, and he responded when Whitmore came charging up alongside at the eighth pole. I would have loved to see Whitmore continue his run, but considering the loss of ground on both turns and losing more ground turning into the stretch, you have to look at his performance as a positive one. There definitely is still room for improvement and no reason to doubt his ability to keep moving forward. His female family shouts mile to mile and an eighth, but Pleasantly Perfect should carry him as far as he needs to go. For now, however, he is still a live Derby contender, who just needs to finish off his opponents. Irad Ortiz was riding him for the first time and no doubt learned a lot about the colt from this race, mainly when to pull the trigger and getting him to cut the corner turning for home. Of course, not getting hung wide on both turns will help as well. He drew the rail for the Louisiana Derby, for which he’s been working sharply. If he shows the natural progression that is expected off his Risen Star victory, he should be right there once again. I just have to question the timing of the Louisiana Derby, with its 6-week gap to the Kentucky Derby. You can run back in three weeks if a trainer so desires, and have another three weeks to the Derby, but don’t count on many of them thinking that way, not in this conservative era. Just remember, as I’ve mentioned, no horse has ever won the Kentucky Derby coming directly off the Louisiana Derby. Only two horses have ever won both races, and Grindstone in 1996 ran in the Arkansas Derby and Black Gold in 1924 ran in the Derby Trial. So, no matter who wins the Louisiana Derby, you do have to at least wonder how they will fare six weeks later at Churchill Downs. I’m not sure what to make of his draw. In an 11-horse field, you do not want to get trapped on the rail at Fair Grounds, where horses usually find problems in the stretch, and he will be picking up six pounds off the Risen Star, where he was in receipt of four pounds from the horses who finished second and third. But he’s won three of his four starts and is undefeated on a fast track. The guess here is that Geroux will try to wait longer this time before making his move. At Fair Grounds you usually want to be the hunter, not the hunted, down that long stretch. What I said about not wanting to be down on the inside in the stretch applies doubly to him, as he has found more than enough trouble in the two races in which he was down in there. In his victories in the Street Sense and LeComte, he fanned way wide and blew right by his opponents. If anyone thinks he’s a late-running plodder, in the Street Sense he charged to the lead about 7 or 8 wide just after turning for home. And he does have the speed to have broken his maiden going six furlongs. One thing in his favor regarding the long layoff after the Louisiana Derby is that he will be making his fifth start at a mile or longer. He just needs to improve his speed figures, which have remained pretty steady over his last four starts, and not quite as fast as you would like to see for a Derby horse. What is unusual about him is his sire is the brilliant Uncle Mo and his dam is out of a champion sprinter and multiple graded stakes-winning miler. You have to admire him for his consistency, especially considering his running style, having never finished out of the money in six starts, and excelling at different tracks and different distances. I am officially stumped when it comes to this colt. He’s just not running like a Derby horse and certainly not closing like one. And even his trainer questioned how far he wants to go and is giving him one more chance in the Santa Anita Derby and hope for the best. How much should we attribute his third-place finish in the San Felipe to the bad start and ridiculous premature move and how much should we attribute it to an inability to come home? For those who believe he does not possess the will to win, let’s remember he has won three races, including two graded stakes sprinting and going two turns. His problem seems to be the lack of a true weapon. He doesn’t possess the raw early speed to wire his field, and he doesn’t possess the closing punch to catch horses in the stretch. So where exactly does that leave him? He does have talent, and he does have the speed to track any kind of pace and the class to run with any horse. But one thing is sure, you don’t want to see him eight lengths behind the next-to-last horse in the first sixteenth of a mile. It’s starting to look as if he needs a perfectly timed ride where everything falls into place to at least give him a chance to win. He wasn’t beating Nyquist going 7 furlongs in 1:20 3/5 and he wasn’t winning the San Felipe with that crazy trip. He has one more chance, in the Santa Anita Derby, to show he does have the weapons and knows how to use them. Would I be surprised to see him put it all together in the Santa Anita Derby? Absolutely not, but after eight career starts, I just need to see it. As I mentioned earlier, it was a dilemma trying to figure out what to do with these Rebel closers. I think very highly of CREATOR, and CHERRY WINE and see both of them as legitimate Derby horses. But they are so closely matched, you either have to include both of them on the list or keep them here, bubbling just under the surface, until their next start or if I get an epiphany in the next week or two. They both now have stakes experience and have shown they can compete at a high level, and both should still have a great deal of improvement in them. I expect them to be a major force on the first Saturday in May, and this is the time, off a defeat, to take a shot on them in the future book and the next Future Wager, assuming they are among the 23 individual betting interests. I’m looking at both of them as potential huge overlays. So, while they both are just outside the Top 12, it’s not going to take much to bump up one or both. I just need to watch the Rebel Stakes another 12 or 13 times. Creator and Cherry Wine came into this race totally different, with Creator making his third start in five weeks and Cherry Wine not having run in 10 weeks. For both of them to run as well as they did under those circumstances bodes well for the future. Both launched their rallies from the back of the pack, with Creator taking the wider route and Cherry Wine slicing his way between horses and easing out for running room, which is ideal when prepping for the Kentucky Derby. What I also like about Cherry Wine is the way he was able to hold off the fast-closing Suddenbreakingnews for fourth. Wherever he runs next, if he gets a clean trip I would extremely surprised if he didn’t run a huge race. Cherry Wine’s trainer Dale Romans said he’s unsure of the horse’s plans right now. He could return in the Arkansas Derby or van to Kentucky. Romans also has another Arkansas Derby hopeful in UNBRIDLED OUTLAW, who made his 3-year-old debut in an undercard allowance race at Oaklawn against older horses, and the colt ran huge, setting a crisp pace and just failing to hold off the winner, while pulling well clear of the others. This is a colt Romans has been extremely high on since day one. Romans appears set for the Blue Grass Stakes with my former No. 3 rated horse BRODY’S CAUSE, who will get a chance to redeem himself after his dismal effort in the Tampa Bay Derby. It would not be a surprise to see him rebound off that with a big effort, only because of the track he’s coming off. If Cherry Wine does ship to Kentucky, he would also be a good possibility for the Blue Grass. My two other future book overlays I’ll take right now are MY MAN SAM and FLEXIBILITY, both from the barn of Chad Brown, who breezed both of them, along with unbeaten SHAGAF, a half in :48 3/5 over the Belmont training track. My Man Sam will either stay home for the Wood Memorial or head to Kentucky for the Blue Grass Stakes, depending on which looks like the better spot to pick up points. For those fans of GIFT BOX, who had a costly Derby setback a couple of months ago, he finally returned to the work tab for Brown, breezing a half in :50 4/5. Also in New York, the fastest two-turn horse east of Danzing Candy looks to be MATT KING COAL, who has tremendous speed and can carry it a distance. They way he won that Aqueduct allowance race, beating My Man Sam and Mo Power off a layoff, he should be pretty tough to handle in the Wood Memorial, especially after breezing a sharp 6 furlongs in 1:13 over the Belmont training track. He is another who likely will be the speed of the speed, and no use changing what’s been working. The other tough decision this week was what to do about Todd Pletcher’s two enormously talented and lightly raced colts ZULU and OUTWORK. I hated having to drop Zulu several weeks ago because he hadn’t worked in almost three weeks and I hated having to drop Outwork this week, but had to make room for Cupid and couldn’t drop the two beaten Rebel horses who were already on there. Not only is history against horses in general with only four career starts, but they are really bucking history by trying to win the Derby with two of their four starts coming in sprints. In Outwork’s case, one of those sprints came last April going 4 1/2 furlongs. But I do believe these are both gifted colts, which is why I had Zulu in the Top 12 in Week 1, and they no doubt will be back in the Top 12 soon enough. When Zulu won a 7-furlong allowance race on Jan. 15, he didn’t work again for 21 days. Following his second-place finish in the Fountain of Youth, he didn’t work again for 20 days. With such a lightly raced horse, with so few miles under him, you have to wonder how much these races are taking out of him that he needs three weeks to get back on the work tab. But he is back, breezing a half in a leisurely :50 4/5. It’s certainly no wonder why Pletcher has scrapped the Florida Derby in two weeks rather than have to face both Mohaymen and Nyquist. That would be asking a lot of the colt, who right now needs to get some bottom, experience, and a fairly competitive race and not get caught up in a potential gut-wrencher against the two Derby favorites. He’ll obviously show up in either the Blue Grass Stakes, Wood Memorial, or Arkansas Derby, depending on what Pletcher does with Destin, Outwork, Donegal Moon, and Mo Power. He has recent allowance winner BATTERY in Saturday’s Louisiana Derby and that will probably be it for him until the Derby. As those major preps get closer, you can expect Zulu and Outwork to be back in the Top 12, based on how talented I believe they are, even though I believe they are behind the others. With no Sunland Derby, Pletcher is faced with a possible log jam and will have to double up somewhere. The good part is that, unlike typical Pletcher Derby campaigns, he has all his Derby horses peaking at the right time. If you’re looking for a relatively new face who could be a live longshot for the Santa Anita Derby, keep a close eye on KASSEOPIA, who ran huge to finish a troubled third in the El Camino Real Derby after breaking extremely slowly. The former English-trained horse, who romped by 9 lengths on the all-weather surface at Kempton last fall, worked 6 furlongs in a bullet 1:12 4/5 at Santa Anita for Graham Motion. Because he has been handling the dirt so well in the morning, they will seriously consider the Santa Anita Derby if they feel he won’t be able to get in the Spiral Stakes. He has shown good tactical speed, in the Grey Stakes, and the ability to close from far back, as he did at Golden Gate. Gary and Mary West now have a pair of top 3-year-old prospects, but look to be a race behind as far as being a legitimate Derby contender. The Wests’ MALIBU SUNSET is unbeaten in two starts and looks like he has a bright future. Now they have AMERICAN PIONEER, who won the second race of his career Saturday, breaking his maiden by nearly four lengths at Oaklawn Park, running only three-fifths of a second slower than the Rebel and doing it the right way. The son of Awesome Again had finished an excellent second in his career debut behind Dazzling Gem, who is entered in the Louisiana Derby, so he also looks like a top-class colt. While the 3-year-old stakes fields at Oaklawn and Fair Grounds continue to draw large fields, and Oaklawn also getting deep, talented allowance fields, the Gulfstream stakes remain sparse. They scored a coup this year with their $1 million bonus attracting the undefeated Mohaymen and Nyquist for the Florida Derby, but as of now, only the late-closing FELLOWSHIP looks certain to join them, along with the maiden winner MAJESTO. There could be a few others trying to pick up a piece of the $1 million purse. One of the factors that has thrown this year’s Derby picture out of whack is the multi-weapon arsenals of megatrainers Bob Baffert, Todd Pletcher, and Chad Brown. 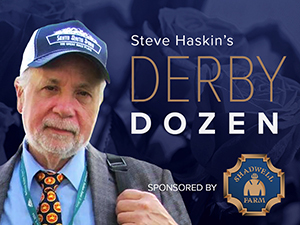 Among their stock are top Derby contenders Mor Spirit, Cupid, Collected, Destin, Zulu, Outwork, Donegal Moon, Battery, Mo Power, Gettysburg, Shagaf, Flexibility, and My Man Sam. Almost all of those horses have either not raced at Gulfstream or have departed Florida. Several of them could conceivably race in the Florida Derby, but it doesn’t appear as if trainers have any desire to try to get their final chance at Derby points by going against the top two 3-year-olds in the country. Baffert and Pletcher hooked up in Sunday’s Sunland Park Festival of Racing, in which Baffert’s even-money favorite COLLECTED outran Pletcher’s 8-5 GETTYSBURG to win by two lengths in 1:48 4/5. Both horses were rebounding off disappointing efforts and ran one-two the whole way around, with Gettsyburg finishing seven lengths ahead of the third horse in the 11-horse field. Gettysburg’s performance is another example of why you can’t take poor races at Tampa Bay too seriously. Gettysburg never picked up his feet in the Sam F. Davis, but was a different horse at Sunland. One of the horses I mentioned a few weeks ago as a possible live future book longshot is CONQUEST WINDYCITY, who breezed a half in :48 4/5, and has his work cut out for him in the Louisiana Derby. But he looks like a good one. Also on the Louisiana Derby front, TOM’S READY, breezed an easy 5 furlongs in 1:02, and DAZZLING GEM went his 5 furlongs in 1:00 4/5. Based on his performance in the Risen Star, it’s going to be interesting to see if anyone catch CANDY MY BOY, who has risen from the $15,000 maiden claiming ranks, in which he was beaten 12 lengths, to a dangerous speed horse in top-class company. He finished a very strong fourth in the Risen Star, setting rapid fractions from the 11-post, and was beaten only 2 1/4 lengths. He showed he’s ready to take them on a merry chase again, working a half in :47 4/5. AIROFORCE, who appears to be back on the Derby trail and headed to the Spiral Stakes, turned in a sharp 5-furlong drill in :58 4/5 over the all-weather track at the Ocala Training Center. COCKED AND LOADED, who could make his 3-year-old debut in the Blue Grass Stakes, worked a bullet 5 furlongs in :59 4/5 at Tampa Bay Downs. At Santa Anita, Breeders’ Cup Juvenile runner-up SWIPE also continues to move closer to his debut, working 6 furlongs in 1:12 4/5. There were several other Wood Memorial horses on the Belmont work tab this week, with ADVENTIST breezing an easy 6 furlongs in 1:17 2/5 and CADEYRN breezing a sharp half in :48 flat. At Los Alamitos, Gotham Stakes runner-up LAOBAN breezed 5 furlongs in 1:01 1/5.